I love kisses and cuddles from my dog, but I hate the smell of him breathing on my face. Does anyone really enjoy dog breath? It’s no wonder dogs’ breath isn’t pleasant — they don’t brush after each meal or see a dentist twice a year for checkups, so of course their breath is going to be awful from time to time. That doesn’t mean you have to just live with it, though. More: The dewclaw debate: Should you keep them or not? Most cases of bad breath in dogs have to do with bad oral hygiene, just like with people. The odor comes from a buildup of bacteria in your dog’s mouth and gut, and can be made even worse by plaque, tartar and disease of the gums and teeth. 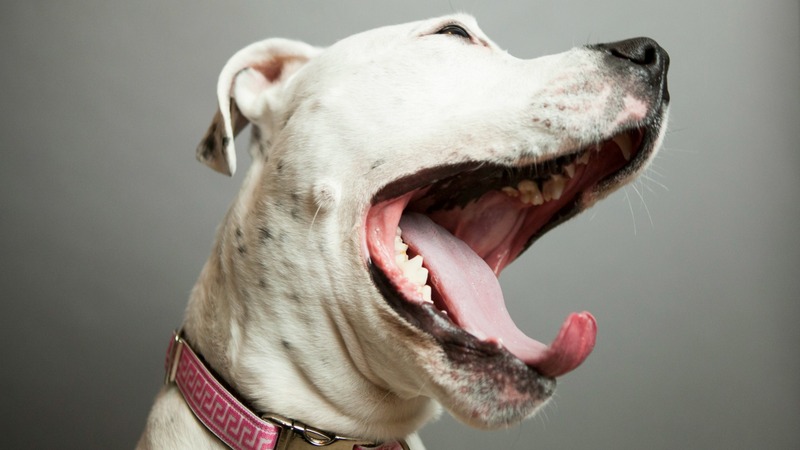 Oral health isn’t the only reason for bad breath in dogs, though. According to the ASPCA, it can also indicate chronic, sometimes serious issues. If the bad breath you’re dealing with smells like urine or ammonia, your dog may have a kidney issue, and unusually foul-smelling breath accompanied by vomiting and yellow gums can signal liver disease. Even breath that smells like sugar isn’t a good thing — breath that smells too sweet may be a symptom of diabetes. Before you take the treatment of canine halitosis into your own hands, consult your veterinarian to find the cause. Contact them right away if your dog’s horrible breath is accompanied by other signs of illness, such as vomiting, lethargy, loss of appetite or weight loss. If you’ve determined your dog’s bad breath is stemming from an oral hygiene issue, the only way to deal with is to treat the problem directly. Unfortunately, you can’t just hand your dog a toothbrush and bottle of mouthwash and direct him to the nearest restroom. Start the process by booking a teeth cleaning with your vet — they’ll probably keep your dog for several hours, and do a thorough cleaning, dental exam, X-rays and surgery to remove decayed teeth if necessary. Dental cleaning for dogs is always done under general anesthesia, so they can clean under and around the gums without agitating the dog — or endangering anyone’s fingers. How often your dog needs his teeth professionally cleaned has a lot to do with genetics and breed, since smaller dogs tend to accumulate tartar and bacteria much faster than large dogs, but the general advisement is once a year. Once your pup’s pearly whites have had a professional cleaning, it’s your job to keep them looking (and smelling) great. Brush your pup’s teeth at least twice a week to keep the buildup at bay, and hopefully keep his breath smelling somewhat fresh. What your dog eats can also have a big impact on his nasty breath. You won’t be surprised to hear that dogs who eat feces tend to have breath issues, but other culprits exist, such as canned dog food and table food. Serve your dog meat-based dog foods that digest easily to stay on top of breath issues, and don’t moisten the food unless medically necessary. The crunch helps clear bacteria from the teeth. For natural ways to freshen your dog’s breath, try adding parsley to his food or letting him crunch on raw carrots. It’s a no-brainer, but keeping him out of the trash and putting an end to backyard “treasure hunts” will also greatly improve his breath. Some treats are specially formulated to improve your dog’s oral health, and those can be beneficial when paired with a good teeth-cleaning regime. Hard, safe dog toys can also help, since the act of chewing is a great natural way for dogs to clean their teeth. Now that I’ve studied up on all the reasons for bad breath in dogs, I realize I have a long way to go before my pup’s breath smells even a little bit pleasant. We’ve been using specialized treats and toys, but those just aren’t cutting it. I’ve added parsley to his food bowl, and lucky for me, he hasn’t noticed. It does have a positive effect on his nasty breath, but that’s short-lived. I finally bit the bullet and made an appointment for a teeth cleaning with our vet, and once that’s taken care of, I plan to start brushing his teeth — something I never thought I’d actually do — but it’s worth it if it tames the stink.